While studio gear reviews can be carried out in a controlled environment, live-sound equipment is best tested in the heat of battle — and a medium-scale outdoor festival always provides a great opportunity to try out new things. I help organise Malvern’s West Fest, an annual festival run across three stages (one small and two large), where any profits are fed back into the local community in the form of grants to appropriate causes. Last year we used it to review some HK Audio kit, so this year I took the opportunity to check out some new Fohhn equipment, specifically the LX-61 mini line-array speakers and D-2 1500 power amp. We decided to go for the line-array option as line arrays have a wide horizontal dispersion combined with a tightly controlled vertical dispersion, so less energy is wasted above the heads of the audience — which also means less sound escaping to annoy anyone outside the area. Part of Fohhn’s Linea range, the LX-61 is a very compact (130 x 640 x 120 mm), passive, mini hybrid line-array speaker weighing just 5kg, designed for both portable and installation use and able to handle up to 200 Watts of power (up to 800 Watts peak). Connection to the LX-61s is via Speakon, which includes a second parallel-wired Thru socket for daisy-chaining, though there’s also a recessed terminal strip for more permanent installation use. There are eight threaded M6 rigging points for installation use, and an optional pole-mount adaptor is available. Inside the powder-coated aluminium enclosure are four, four-inch neodymium drivers plus a one-inch compression driver feeding into a waveguide shaped to match the dispersion of the tweeter to that of the cone drivers. If you are wondering about the term ‘hybrid’, that’s because the speaker uses a separate single tweeter, which obviously isn’t a line-array source, though the waveguide is designed to make it behave as much like one as possible. The internal passive crossover that manages the signal split between the cone drivers and tweeter incorporates what Fohhn describe as an Intelligent Protection Circuit, or IPC, to protect the drivers from damage through overload. A layer of acoustic foam is fitted between the perforated metal grille and the drivers to provide a useful degree of weather resistance. A long line array produces a near cylindrical wave front to provide wide horizontal dispersion and narrow vertical dispersion, and while shorter lines depart from this theoretical ‘cylindrical’ model, there’s still some benefit even with a line this small — the specified horizontal dispersion of the LX-61 is 130 degrees, and the vertical just 30 degrees in the 1 to 4 kHz region. All LX-series line arrays are designed to be used with a Fohhn subwoofer or a power amp set to the appropriate speaker setting to ensure the correct crossover characteristics between the sub and mid/high speakers. The LX-61 will work with Fohhn AS-10, AS-20, AS-30, XS-10, XS-20, XS-22 or XS-30 subwoofers. For our tests, we used an XS-22, which we reviewed back in May: www.soundonsound.com/sos/may15/articles/fohhn-xs22.htm. All of Fohhn’s amplifiers and active subwoofers incorporate DSP speaker management, and have a small LCD window on the rear panel to aid setup. By choosing the appropriate ‘top’ speaker from the menu, the correct crossover and power-limiting parameters for the speaker are called up. XS-30 models and upwards can power a stereo pair of tops, while the LX-22 and below can only power one or two tops in mono. The operating frequency range of the LX-61s is from 85Hz to 20kHz with a peak SPL capability of 119dB at one metre. Though the standard finish is black, the Linea LX speaker range can be finished in any RAL colour to special order. Though powerful enough to use as a main PA in smaller venues (in combination with a suitable sub), we used the LX-61s in mono as side-fills on the marquee stage, where they were powered from my own Fohhn XS-22 active subwoofer. The D-2 1500 power amp was used on the main stage to power a pair of Fohhn LX-601 line-array speakers underpinned by a pair of XS-4 powered 18-inch subs, all of which was kindly loaned to us by Systems Workshop. We’ve used the LX-601 speakers before but this was our first opportunity to use the D-2 1500 power amp which, along with the LX-601 and XS-4, turned out to be all we needed for the front-of-house sound on the main stage. This year the second stage was set up in a large marquee measuring approximately 20 x 30 metres with a bar at one end and a low stage at the opposite end, arranged diagonally across one corner. There we used my own Fohhn XS-30 15-inch active sub and Fohhn LX-100 line-array speakers as the main PA, a system we’ve used before and that gives good coverage. However, with such a large tent and a need to get the music audible to those outside enjoying the sunshine, we also added a little distributed sound using an assortment of daisy-chained ‘plastic box’ powered speakers provided by other members of the organisational team and fed from the mono output of the mixer. Our review LX-61s came in a single padded bag designed to accommodate both speakers with their mounting kits still attached. Optional mounting kits are available, though we used the one that slots onto a standard pole-mount. A block of foam in the centre of the two bags protects the ends of the speakers while Velcro straps hold them securely in place. Used with one of Fohhn’s 10- or 12-inch subs, the LX-61s would make a very high-quality and easily portable mono PA for smaller venues and, like the rest of the LX series, the sound quality is much more ‘hi-fi’ than you might expect from a PA speaker. A passive sub with an in-built passive crossover can also be added, allowing the tops to be driven in stereo. Before the show started we played pre-recorded music through both the main stage and marquee stage systems, which just confirmed the audio quality of these line arrays. No EQ was needed. As side-fills the LX-61s, set at head height, turned out to be excellent. I played a set on that stage as part of the Ray Mytton Band and what we heard on stage was exactly like being out front — very little contribution from the floor monitors was needed. Over the course of the day, we had an eclectic mix of electric and acoustic acts on that stage, including one band with an electronic drum kit DI’d into the system, and it coped beautifully. Without the additional distributed speakers the system would have struggled to cover the far extremes of the marquee and the seating area outside, but for such a compact system its reach was remarkable. Back on the main stage we ended up with the two XS-4 subs, one on the floor either side of the stage, but used a separate Fohhn D-2 1500 power amp to drive the LX-601 line-array speakers. As with the subs used in the marquee, the amplifier’s built-in menu enabled us to select the correct parameters for the LX-601 speakers by simply choosing them from the menu. Note that the menu also includes options for generic speakers over a range of power settings, so their amplifiers aren’t limited to use only with Fohhn tops. Phil Beaumont from Systems Workshop arrived on the morning of the event with the whole system in the back of his SUV, which is pretty impressive given we had close to 6kW of system power. Though this power might seem modest by festival standards, the volume was more than loud enough for those standing close to the stage, while the long throw of the line-array format still left us with plenty of level at the opposite side of the field. Fohhn’s subwoofers also have a very tight sound so you don’t get mountains of flabby bass. There’s depth and punch, but unlike some cheaper subs, what’s going on at the bottom end doesn’t cloud the mid-range, which again aids the overall impression of clarity and quality. At the height of the day we had the limit LEDs flashing on the D-2 1500, but you wouldn’t have known it from listening to the system. We had many positive comments on the clarity of the sound from both the musicians and the audience members, and aside from a small glitch during the final band’s set, when it turned out the wireless silent disco was using the same frequency as one of our radio devices, everything ran to schedule with no equipment problems. Everything was powered from generators, and we did have our own generator for the main stage, but in the marquee tent the PA system was fed from a long cable sourced from the bar end, which meant we were sharing a generator. Nevertheless, everything ran perfectly from power-up to break-down with no hiccups and no muting from the protection circuits. For the gigging musician, Fohhn gear can seem very expensive, though compared with its high-end contemporaries, it is still very competitive. However, the price has to be weighed against the excellent sound quality, portability and the knowledge that the gear is built to last and has a professional level of backup support. Similar column-style PA systems are available from the likes of HK Audio, Bose, LD Systems and FBT. Combining switch-mode power supplies, Class-D amplifiers and DSP-controlled speaker management, the D-2 1500 can output 1500 Watts per channel into 4Ω (or 900 Watts per channel into 8Ω), yet weighs only 10.5kg and occupies just 2U of rack space, with a depth of 380mm. The minimum load impedance is 4Ω, and the outputs are on Speakons. 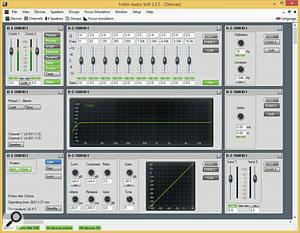 The front panel includes the same back-lit blue LCD four-line display as the active Linea-series subs for navigating the setup menus, though network ports are also fitted at the rear to allow direct control from a computer via a Fohhn programme called Audio Soft (which, at present, is PC only). 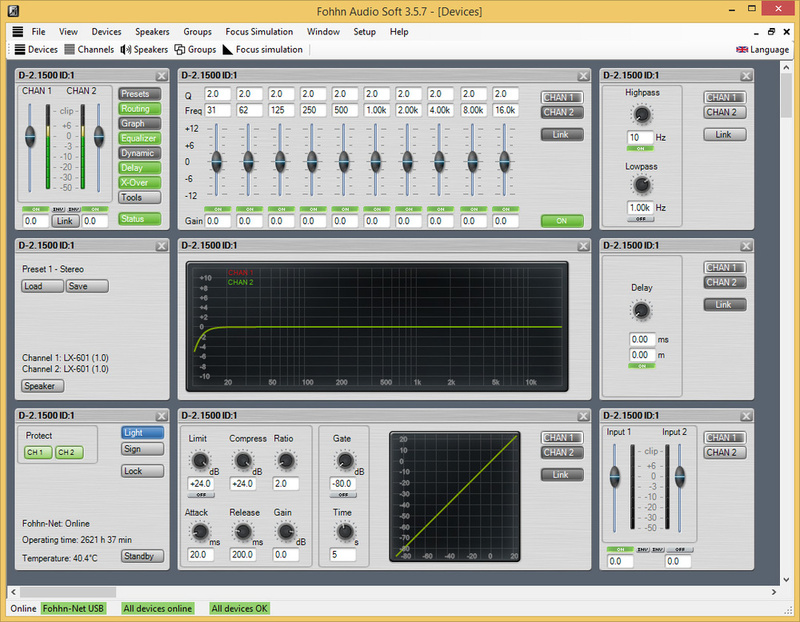 Fohhn’s Audio Soft application allows you to control the D-2 1500’s DSP functions remotely over a network. Cooled by low-noise fans, the amplifiers run at a sensibly low temperature even when working hard. Protection circuitry monitors the mains voltage and interrupts the power to the amplifier if this falls outside a 180 to 255 V AC range. This same circuitry also manages a ‘soft’ switch-on to prevent power surges. By way of general specifications, the amplifier is essentially flat from 20Hz to 20kHz and can provide up to 35dB of gain; a basic LED meter shows the level, and additional LEDs warn when the limiter is stepping in. A further LED shows the amplifier is powered up and ready for business. All gain adjustment is done via the data knob and cursor buttons, which are located adjacent to the display. Noise and distortion is so low as to be negligible in any practical application. What makes this amplifier so flexible is the built-in stereo DSP, which has 56-bit, double-precision filters that do away with the need to budget for external speaker processors. Conversion is 24-bit at 48kHz. A speaker database, which can be updated with a firmware update when necessary, sets the correct crossover and limiting parameters for any connected Fohhn passive speaker as well as a useful selection of generic types and powers. The various DSP options allow for using the amp to power stereo passive tops when used with active subwoofers, to power two passive subwoofers when used with active tops, or to drive one passive top and one passive subwoofer, all with appropriate filter settings. These settings include protection for all the drivers as well as a 10-band parametric EQ, delay, a compressor/limiter and a noise gate. You can also view the operating status to monitor the temperature of the amplifier in real time, and also to see the elapsed operating time from new. Highly portable — both the mini line-array speakers and the D-2 1500 amp. A remarkably powerful system that can cover a surprisingly large area, but still fit into a hatchback! LX-61 £838.20 each, D-2 1500 £2929.20. Prices include VAT. LX-61 $1272, D-2 1500 $4442 (prices converted from GBP).